While not snatching any of the prizes, we gained awesome friends and contacts during our visit in Bilbao, and spread the word of Futuregames. Congratulations to all the winners! After the presentations, Shailesh joined our gang of non-spanish speakers. We also met the awesome Marc and Cinta who joined in on cool discussions during the party. The following day, we went to check out Guggenheim which we unfortunately had to just speed through cause we were as usual in a hurry someplace. This time to buy tickets back home, as well as getting to the awards ceremony. Interestingly enough two of the winning games were made by people we got a great connection with! Congrats to Shailesh winning with It’s just a thought, Marc and Cinta with Sr.Mistu! We celebrated/drowned our sorrows, shared some philosophies around games with Lara (who really should start writing her blog in english! ), and met Eneko shortly before we had to take another painstaking walk->bus->flight->bus trip, this time back to the foggy cold north. Without feeling particularly defeated at all, we are looking forward to what the future has in store for us, both as individuals and as a team. 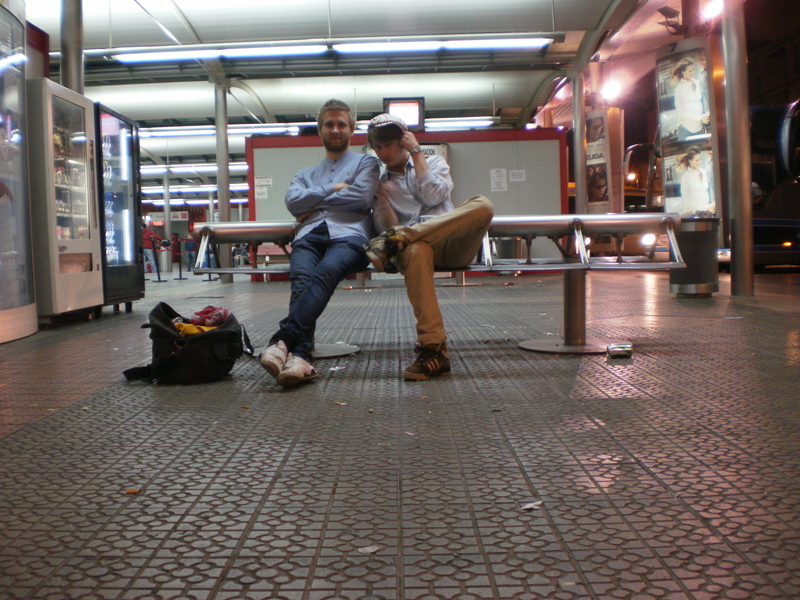 Hóplay 2011 in Bilbao was an awesome experience! 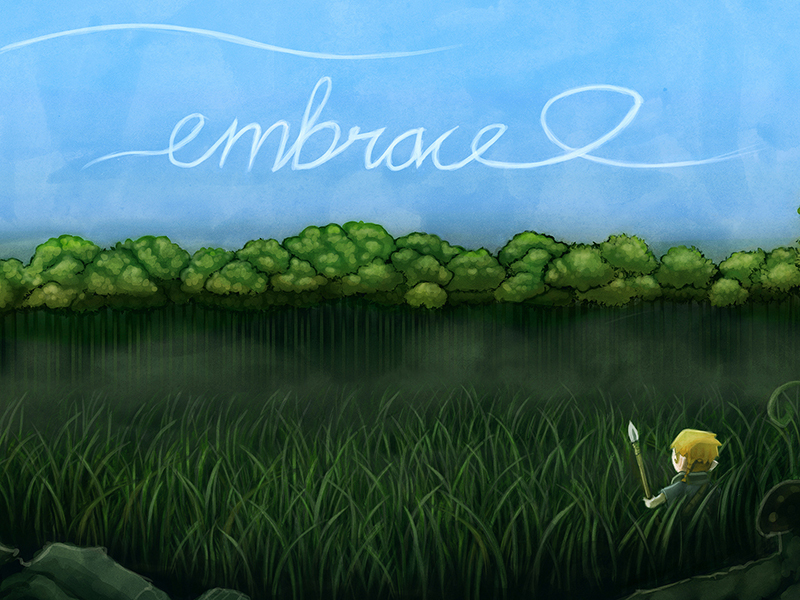 Embrace one of 26 finalists in the II International Videogame Festival hóPLAY’11, Spain, in the category “best design”. Get a first taste of Embrace. This is the full version, but we intend to expand on it. I loved the esthetic of this game. I especially loved how the music changed near the end of the demo. I did not like how I found the larger tree, but I could not find anything interesting besides the tree itself. It was nice to have that kind of special change in the environment, but did not find any sort of reward there for my exploration. I mean a reward so minimal as a different color spear. I loved the feel of not having a clear linear path as what to do, but you showed the player by having boar cooking on the spit, but then removing it making room for one of your kills. The biggest issue for me was having no clue as what to do with my gathered berries and mushrooms as well as not being able to embrace as many things as I wanted to embrace(,but I loved the fact I was able to embrace the antagonist at the end). The best part was definitely the graphics of the game. Does following the swirly lights lead you places? Sometimes I feel like they do, but I'm not sure. I'm stunned by this game. I played it three times today. The first time I played I just wandered around, picked up a few things, and killed a couple boar. The second time I played I decided to wander out a bit further where I reached the wall and quit. The third time I played, it was like magic. I wouldn't want to spoil anything so I'll just say something curious happened, and I ended up reaching the "The End" screen. A short game, but if you plan on adding more content like this, sign me up! SO cool! can't wait until an update that adds more stuff! Ok so i just downloaded it and played it. I killed a boar, got chased by one while i was bringing the boar to camp. But what to do with the mushrooms and plants ??? This could be awesome, the style is very nice and happy. to go fishing or have a sleeping bear in a cave. Also try to play with the day and nightcycle, make certain, some animals only appear at night and some during the day. This could be epic, but it needs more variety in animals and features.